Today has an interesting twist. About an hour ago my twins began to huddle close and whisper to each other about their play. As Keva joined them, she sat nearby & set to “work” adding her soft whisper to the group. 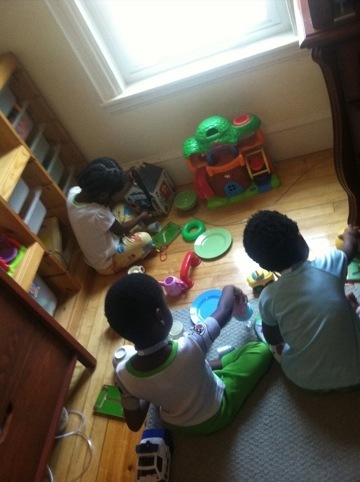 Much of what they are playing is silent, and individual, with occasional sounds of plastic on wood or metal toy pans. An unusual & intriguing moment of childhood.